A term commonly applied to mixtures that are served over various foods either as it finishes cooking or for use after it is served. As an example, a Finishing Sauce may be mixed into spaghetti as a pasta sauce or served as a topping over sliced pieces of roasted meat such as roast beef. 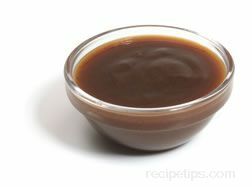 Other types of Finishing Sauces may include red wine sauces, pepper sauces, bearnaise sauce, or mushroom sauces to name a few.